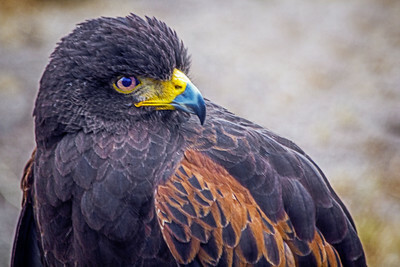 A flight shot of the Harris' Hawk at Sky Falconry, Alpine, CA. 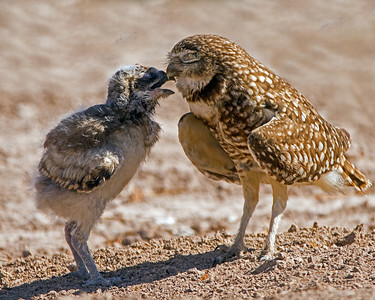 This Burrowing Owl had two owlets. I caught this moment between one of the babies and mom. 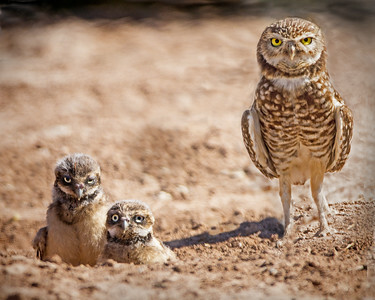 This mother Burrowing Owl was giving me the evil eye, protecting her two young owlets. 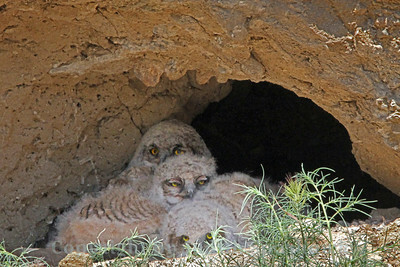 A moment later they zipped down into the burrow and were gone. 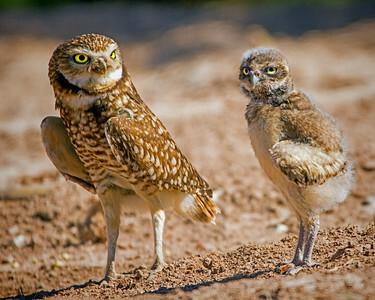 I watched this Burrowing Owl and her young, and got several shots of them both in almost identical poses. It was fun to see baby perhaps copying mom??? 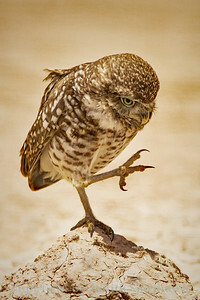 I photographed this Burrowing Owl today, near the Salton Sea. Although I'm not an expert, I think it is a male, who was standing sentinel protecting a mate and nest, and possibly babies. I saw individual owls out like this, but no family groups out of the burrows, so it may be too early for the owlets to have hatched and fledged. I've noticed over the years that during this period the sentinel owls are easier to photograph, as they will stand their ground. I thought this one had a stern look on his fuzzy little face. 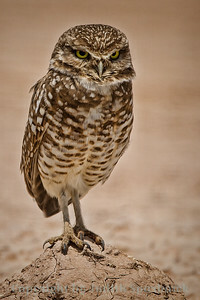 This owl was photographed in the Salton Sea area of Imperial County, CA. Just before the moment the camera caught him, he was scratching his chest. Those talons look like pretty good scratchers! The breeze was ruffling his feathers. 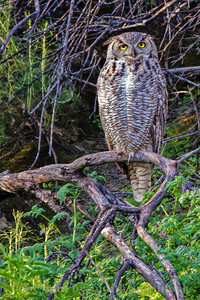 This owl was photographed at Big Morongo Canyon Preserve in Southern California. He was well camouflaged in the big old tree where he was roosting for the day. 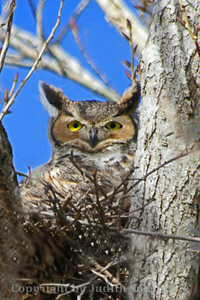 I went back to the Great Horned Owl nest site that I have been monitoring for the last two weeks. 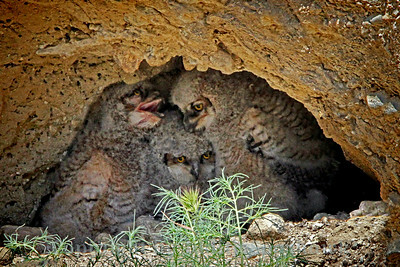 The owlets are growing fast, and I was able to photo graph all three of them, though one seems "shy". 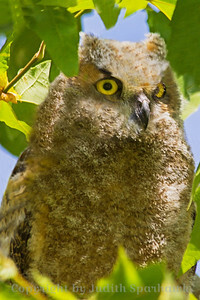 Mom wasn't at the nest, but was observed well camouflaged, up the hill in a small tree. 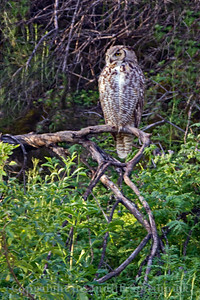 This is the Momma owl from the owl nest I have been photographing. When I arrived at the nest today she wasn't there--after a few minutes I saw her perched up the hill. 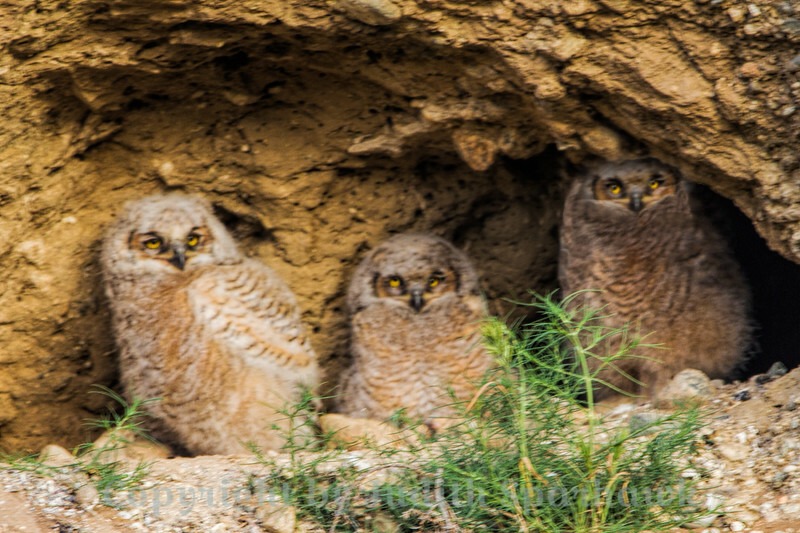 I didn't want to spend much time at the nest, but took a few shots to document the owlets' growth and developent. They are really growing up fast! Photographed in Loma Linda, CA. Do You Ever Feel Everyone Is Talking Over You? 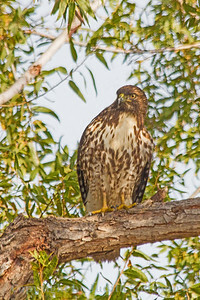 Immature Red Tailed Hawk, San Jacinto Wildlife Area. This immature Red Tailed Hawk was perched in a tree at San Jacinto Wildlife Area, keeping a sharp eye on me as I photographed it. 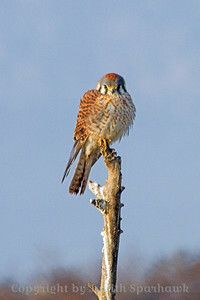 This female kestrel was perched by the road through San Jacinto Wildlife Area. She allowed me to drive quite near, to photograph her. 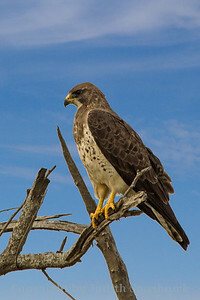 This immature Red Tailed Hawk sat still for me to photograph, then decided enough was enough! 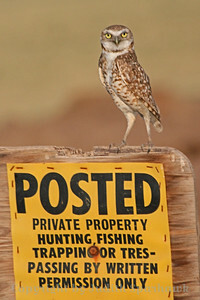 This Burrowing Owl was photographed in the Salton Sea area. 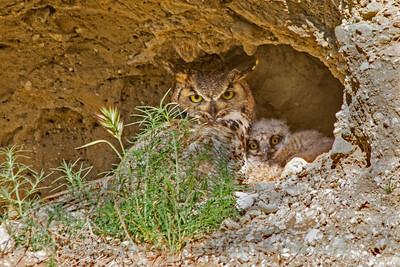 The young owls are out of their nest burrows; this parent was standing guard near the nesting site. While photographing this young Great Horned Owl, I walked around the tree to get to a less leafy spot, which was behind the owl. Keeping an eye on me, he swiveled his head completely, looking over his back. 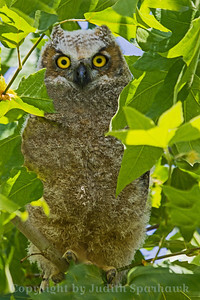 This young owl was photographed in a Liquid Amber tree in the local park in Redlands, CA. 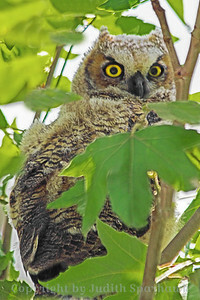 Great Horned Owl Baby ~ Photographed at the local park down the street from my house in Redlands, CA. ~ To avoid the leaves, I walked around the back of the tree and the owl, so this shot is of his back, looking over his shoulder at me. 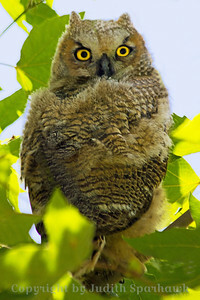 Baby Great Horned Owl ~ This young owl was perched in a tree in the local park. He was low enough and close enough to shoot him well, despite the leaves in the way. 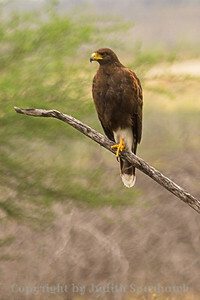 Swainson's Hawk ~ This hawk was photographed in Central Texas. 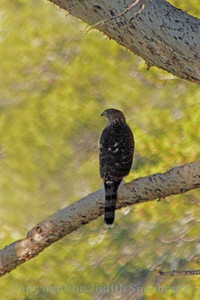 Northern Goshawk ~ This isn't a particularly good photograph, but I was thrilled to get any picture at all of this wonderful forest hawk. 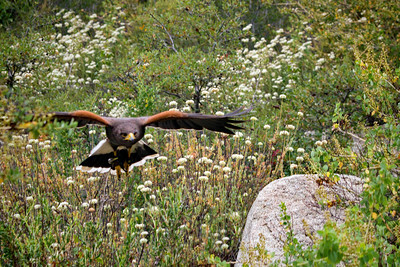 He flies very fast in forests, zipping around and between trees, altering his angle and position to avoid collision. 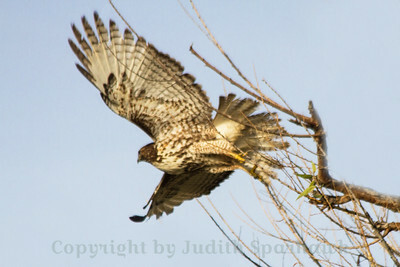 His fast stealth flight is his means of taking birds and small mammals by surprise, finding breakfast on the fly. He was photographed at Virginia Lakes, at high elevation, north of Lee Viniing, in the eastern Sierras. 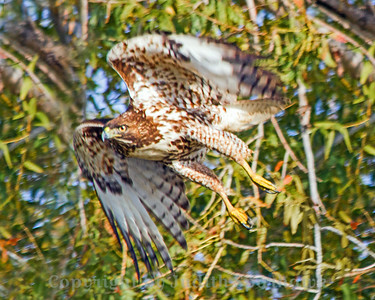 Harris's Hawk Take-off ~ Guess I got a little close to this hawk, so he took off. Was glad to get a shot of this as well. 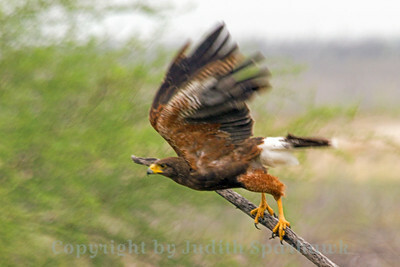 Harris's Hawk ~ Photographed in south Texas. 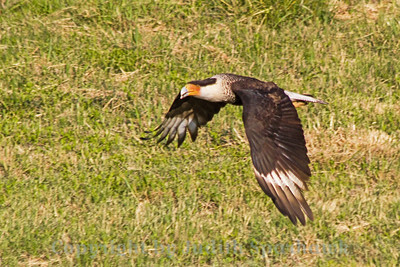 Crested Caracara ~ Photographed in central Texas. These large scavenger birds are common in central and south Texas, although they weren't anxious to get their pictures taken. This was the closest shot I got. 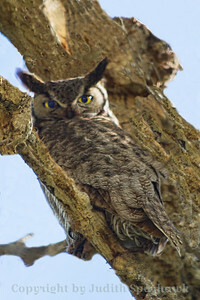 This nesting owl was photographed at Riverside National Cemetery. 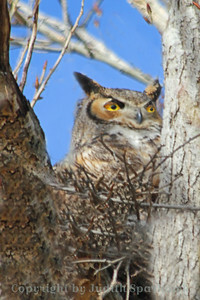 This nesting Great Horned Owl was photographed at Riverside National Cemetery on January 21, 2014. 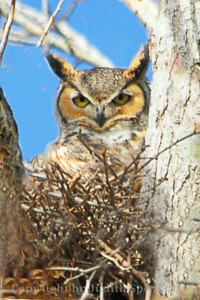 Great-horned Owl ~ This nesting owl was photographed at the Riverside National Cemetery today. 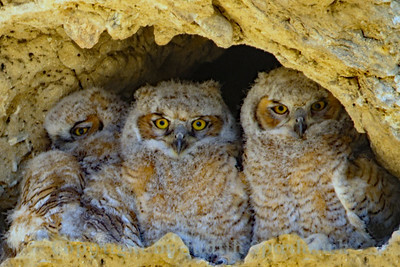 The owls start nesting earlier than most birds--January 21, 2014. 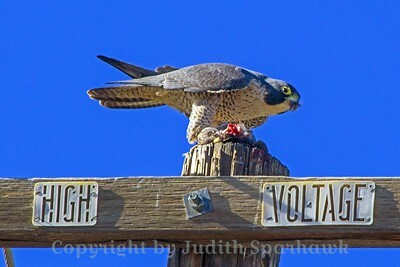 This Peregrine Falcon was enjoying a freshly caught lunch, including plucking feathers. 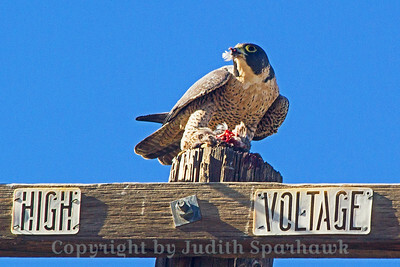 This Peregrine Falcon swooped off the telephone pole, heading for nearby waterfowl. A few minutes later I saw him back on the pole, munching his lunch, feathers flying, and tearing into his prey. Gives a whole new meaning to the term "power lunch". San Jacinto Wildlife Area, California. Burrowing Owl at Burrow ~ This owl popped out of the door of his burrow when I drove by, and watched me for a few minutes before heading back inside. 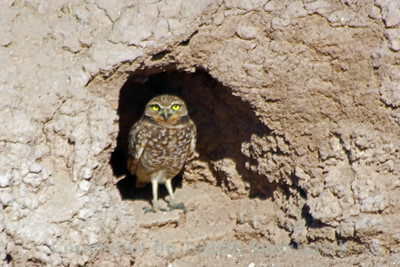 His burrow was in the side of an irrigation ditch by an agricultural field near Salton Sea, CA. 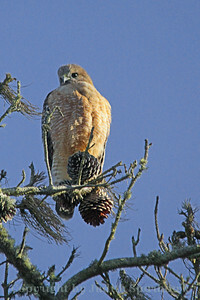 Red-shouldered Hawk ~ This hawk was photographed near the small town of Baywood, along the shore of Morro Bay, perched in a pine tree of some kind. 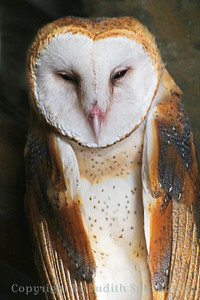 Barn Owl Close-up ~ This Barn Owl looks as if I disturbed his sleep on this day. He did not seem disturbed that I was photographing him, however. 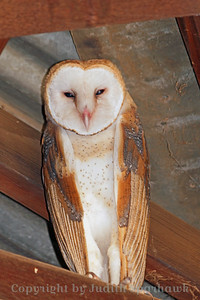 Barn Owl in the Rafters ~ This Barn Owl was roosting in the upper rafters in a local produce stand. I asked permission to photograph him. He was the last of two young birds that had been hatched in a nest in the building. 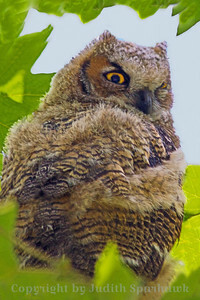 The first owlet to fledge had left two days earlier. I was glad this one waited around for me to see and photograph it! 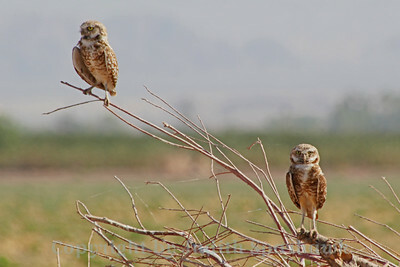 Burrowing Owl Duo ~ Not the best shot, due to the very bright direct sunlight. I liked seeing the pair perched up on this bare shrub, so included the shot anyway. 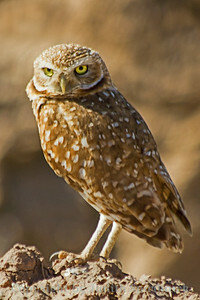 ~ I was down at Salton Sea, and saw many, many Burrowing Owls. Apparently the babies are up and out of the burrows, and the numbers are visibly up. I liked this feisty little guy who was enforcing the no trespassing rules. He stood straight up like this, alternating with lowering to an offensive position and hissing at me. I didn't trespass. 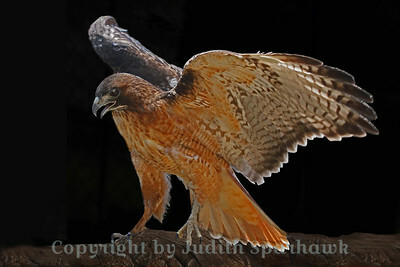 **Awarded 3rd prize in the Calendar Photo Contest, and will be in the 2013 calendar** Red-tailed Hawk Winging It ~ This beautiful Redtail was photographed at Big Bear Rescue Park in Big Bear Lake, California. 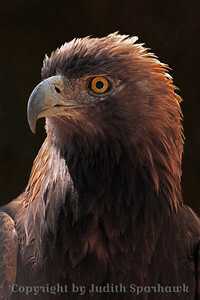 Golden Eagle Portrait ~ This photograph of a Golden Eagle shows the golden head and neck feathers from which it got its name.